In our day and age the internet is spinning with information, opinions, the latest diet craze, way of eating, what to do, what not to do, it’s all so much! We’ll cover the topic of healthy digestion and what that actually means. Of course we discuss food and nutrition, but, we will also discuss how our colon holds onto different emotions in different areas, how trauma and stress is held throughout our GI tract, how energy can block healthy digestion and how chakras come into play with our gut health. We then finish off the workshop getting into our bodies with a 75 minute yin practice dedicated to our organs of digestion and space to allow the mind to take it all in. I have a passion for empowering people to listen to their bodies and educating them with practical and useful information to feel confident in making decisions about their health. When I first started teaching yoga classes in 2006 I found that students were always asking me, what should I eat, what do you eat, is “this” good for me, what supplements should I take?!? It was all so much and of course as any teacher, I wanted to be there for my students and also provide them with the best possible info. I not only did my own research but I enrolled in a Holistic Nutrition course so that I could understand what Nutrition is really all about. When my career took me in the direction of gut health, colonics and my own business, Exhale Wellness Spa, I knew that it was only a matter of time before I could weave my world of Yoga and Digestive Health together. 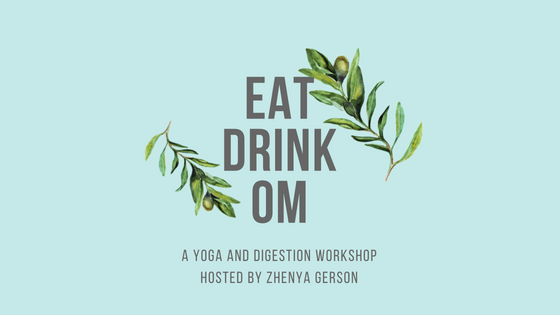 I began teaching my workshops, “Eat Drink Om” several years ago at studios around the Sutherland Shire and South Coast, they then developed into weekend long retreats focused on detoxing and yoga. Nourish yourself, learn self care techniques and relax with Yin Yoga in this 3 hour special workshop. Join our mailing list to receive our top ten good gut tips.